Popiel, (9 cent.). first legendary prince of Poland ruling from Gniezno. Single mentioning about him comes from the Chronicles by Gall Anonymous from beg. of 12 cent. (book I, chapter 1-3). The information is a part of Piast story, the protoplast of Piast dynasty reigning in Poland, therefore it is funded on the Polish Court tradition. 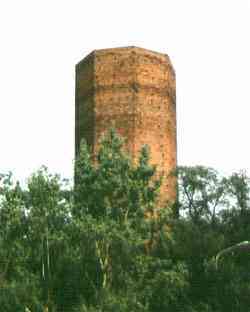 Mice Tower In Kruszwica (remnants of a castle). The castle was a Kruszwica sub-prefect seat. In XIII cent. it was a property of the Calisia prince, Boleslaw, after that it it belonged to the Kujawy princes. Since 1319 it belonged to king Wladyslaw Lokietek. The Teutonic Order knights won the castle in the battle and burned it. King Kazimierz Wielki restored the castle and later he left it by his will to the Slupsk prince Kazko, but the king's will was voided and the castke with the town went to the king Ludwik Wegierski's estate. The castle was once more taken by the Swedes and burned on June 18, 1657. Since then it was just a ruin. Finally it was taken down almost entirelly at the end of XVIII cent. and the brick was sent by barges to Inowroclaw. The 100 feet octogonal tower some of the adjoining walls is all what remains today. The tower was hosting prisoners in the past. Its name comes from the legend on king Popiel who was eaten by mice. The story contains two episodes. The first is related to the cutting of the hair (initiation) of two Popiel's sons ceremony simultaneously with cutting of the hair of Siemowit, son of Piast, poor footman of Popiel; Popiel plays a negative role in that episode since he drove away two strange guests from the feat, what turned to the Piast's advantage for the strangers invited by Piast for a modest treat miraculously increased quantities of food and bear, so that even Popiel with his court and guests invited to share the meal, satiated themselves. The second episode announces elevating Siemowit to the throne at the Popiel's disadvantage. Popiel, stripped of power, hid himself on an island, where locked on a tower he was eaten by mice. Both episodes belong to classic medieval stories, common to many cultures. They can be reduced to two details: Popiel reigned in Gniezno and lost the crown to Siemowit and Siemowit established new dynasty ruling the tribe of Polanie, being a core of future kingdom of Poland. Next, and later to Gall Anonymous chronicler, master Vincent nicknamed Kadlubek, envying the Great Poland (the Great Poland actually was [and is] a Western region of Poland) having a craddle of the reigning family in Gniezno, created a tale about a concurrent princely lineage of Little Poland (South-East region of Poland) with their capitol in Cracow. He named their progenitor Krak (supposedly coming from Carinthia; in reality it was an ancient Roman name of Gracchus sounding similarily enough to suggest that Cracow was named after him), and his successors Wanda, Leszek I, Leszek II and Leszek III, tying the story to Popiel (whom he attributed Roman origin from another ancient name Pompilius) - the First and the Second. Further he indentified his Popiel II with Popiel from Gall Anonymous chronicle ("Kronika polska", ks. I, rozdzial 1-2). Because the master Vincent's dynasty originated in Cracow, he (Kadlubek) carefully removed from his tale fact that all episodes in Gall Anonimous took place in Gniezno, therefore unwitting reader of master Vincent's chronicle may think that Popiel was residing in Cracow. Another chronicler, later to Anonimous and Kadlubek, author of "Kronika slasko-polska" created in Lubiaz about 1285, having to choose between one and another named Kruszwica as a Popiel's place of death ("Kronika slasko-polska", book I, chapter 5-7). From there comes that Kruszwica not mentioned by Gall Anonimous became a part of the Popiel's legend. The chronicler trying to conciliate chronicle of Gall with the other of master Vincent, made Kruszwica the oldest capitol of Poland. In light of that, supposition made by some historians (one of them K. Potkanski) that Popiel met his death on the Ostrow Lednicki (Lednicki Island), however, must be rejected. Additionally it lost its material basis, since the oldest evidence of inhabitation of the island are of the break of 10 and 11 cent. Authenticity of Popiel is often questioned. All stories about him were not much trusted and the amplifications of master Vincent in particular. On the other hand, everything what is related to Piast and Siemowit, therefore to the beginning of the real, reigning dynasty, deserves attention. Contrary to Piast, the name of Popiel emerges sometimes as given name or surname or nickname. The name Popiel has been mentioned by the prince of Rugia Jaromir I in 1207, it is known in Poland in numerous cases in 14-15 centuries. Popiel became a character of literature ("Myszeis" I. Kracicki, "Krol Duch" J. Slowacki (rapsod I), dramat "Popiel i Piast" M. Romanowski and "Stara basn" J.I. Kraszewski). Piast DYNASTY first ruling family of Poland. According to a 12th-century legend, when Prince Popiel of Gnesen (now Gniezno) died, in the second half of the 9th century, he was succeeded by Siemowit, the son of the prince's plowman, Piast, thus founding a dynasty that ruled the Polish lands until 1370. (The name Piast was not applied to the dynasty until . . .